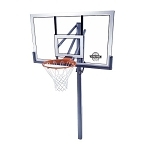 Lifetime basketball hoop model 71525 is an excellent intermediate-level system. 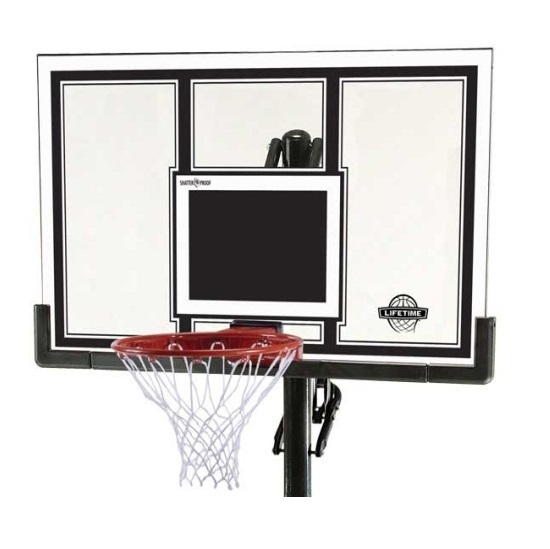 With a 54 inch polycarbonate backboard, this system provides ample space to practice your game including bank shots. The rim height is adjustable up and down from 7.5 feet to 10 feet in infinite increments using the Power Lift height adjuster. The height adjuster is easily used with just one hand. The large, 3.5 inch diameter steel pole provides great structural strength to the system while in use. The backboard material is framed in steel as well, which improves the rebound for the backboard. 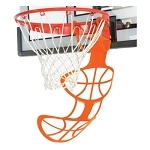 The 71525 also includes the Slam-It Pro breakaway rim and an all-weather white net. All metal structural parts are powder coated to help resist rusting and providing you many years of use. Lifetime Products warranties this product for 5 years. This system also comes with a 30-day money back guarantee. 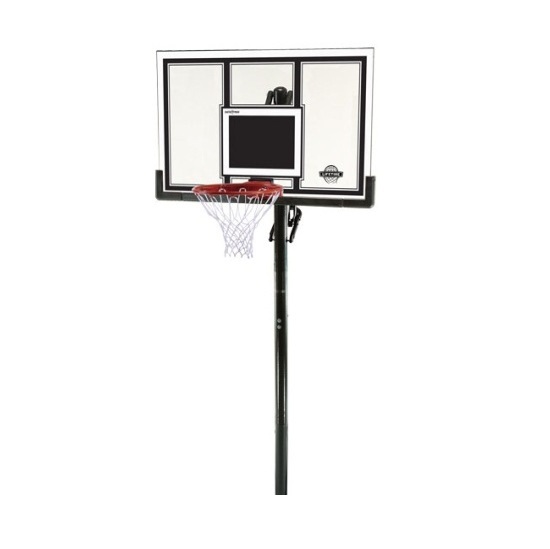 The 71525 features the best specs for an In-Ground basketball system before the next upgraded step in the pole system, the Lifetime 78888 Basketball System, which features a 4 inch square pole. The 71525 has the largest round pole available, the largest backboard available, and the largest frame available for this level of system. 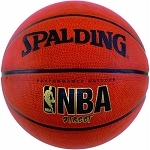 In the pole sizes Lifetime Basketball hoops systems have 2.75 inch models, 3 inch models, and 3.5 inch models. In this range of system, they have backboards as small as 44 inches wide; and they have backboards as big as 54 inches wide, like the 71525. 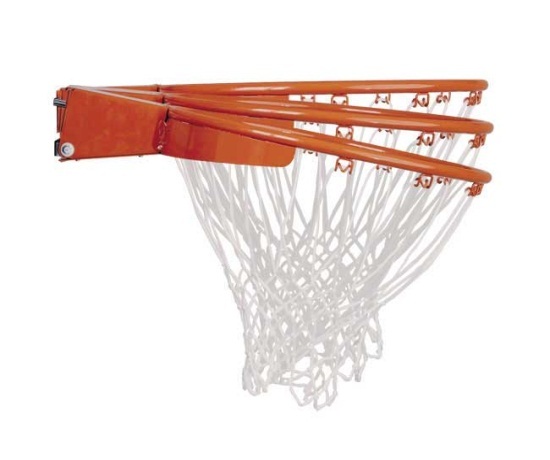 For this level of system, the backboard frames are either steel or plastic. 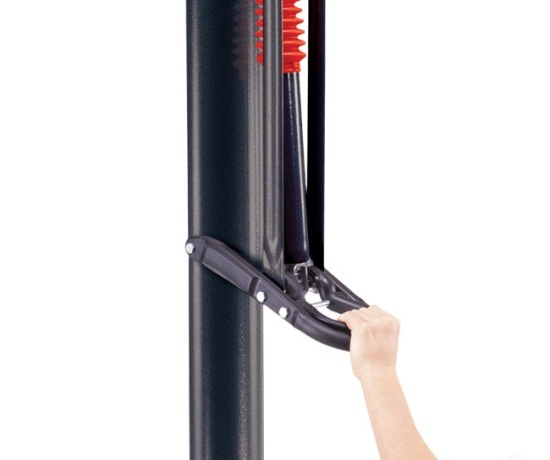 The 71525 has a 1.0 inch steel frame, which provides better support and durability for both the backboard as well as the mounting arms from the pole. 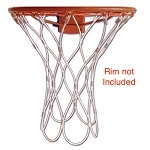 Comes with a regulation-diameter, 18 inch breakaway rim and all-weather white net. True breakaway mount. Holds up well to aggressive play. Super! Product Arrived Fast and in Great Shape - Good Deal All Around! My daughter is very excited about her new goal. Great product. 11 year old using it daily. thanks. Q: Can the 71525 a legal basketball goal and can you cement it in the ground. I am asking because we are looking for one for our church? A: This can be cemented into the ground, and although the rim is regulation height, the backboard is not regulation size. Q: I only have the pole left from this system, can I get a new backboard and bracket? A: Yes, you will need either the 9594 fixed height bracket, or the 1044 adjustable height bracket. You can then choose one of the Lifetime compatible backboards. Q: DO YOU DO INSTALLATION? Q: I need assembly instructions. Where can I get them? A: Simply click on the "instructions" tab and then you can download them or print them. Q: Can I purchase just the backboard and rim without the pole and mount/height adjust for either the 78888 or 71525? A: Yes, you can it is model 71526 on our website to replace 71525. If you are replacing 78888 the only way to get that replacement is by calling 800-225-3865. A: The instruction manual is done very well and walks you through it step-by-step. Basically you dig a hole that is about 3 feet deep and 18 inches in diameter. He spent in the bottom poll section and then assemble everything else on the ground. Once everything is ready your voice the basketball system up over the bottom poll section and slide it on. Q: What is the difference between the 71525 and 78888 Lifetime basketball system? A: There are 3 differences of note between these systems. The 71525 backboard frame is 1-inch thick; the 78888 backboard frame is 1.5 inches thick. The 71525 pole is a 3.5 inch round pole; the 78888 is a 4-inch square pole. Lastly, the 71525 backboard is made of polycarbonate; the 78888 backboard is made of acrylic. Fast Shipping: Orders for the Lifetime 71525 generally leave the warehouse within 1-2 business days.